Do you ever read a book and feel enchanted by its storyline, or its life lessons, or because it speaks to you on many different levels of meaning? How often is that book a children’s book? Since I started writing this blog, I’ve been thinking a lot about the influences that the written word can have on the process of sewing – and vice-versa – and I have found my thoughts going back time and again to a skinny little paperbound book first published in 1986. 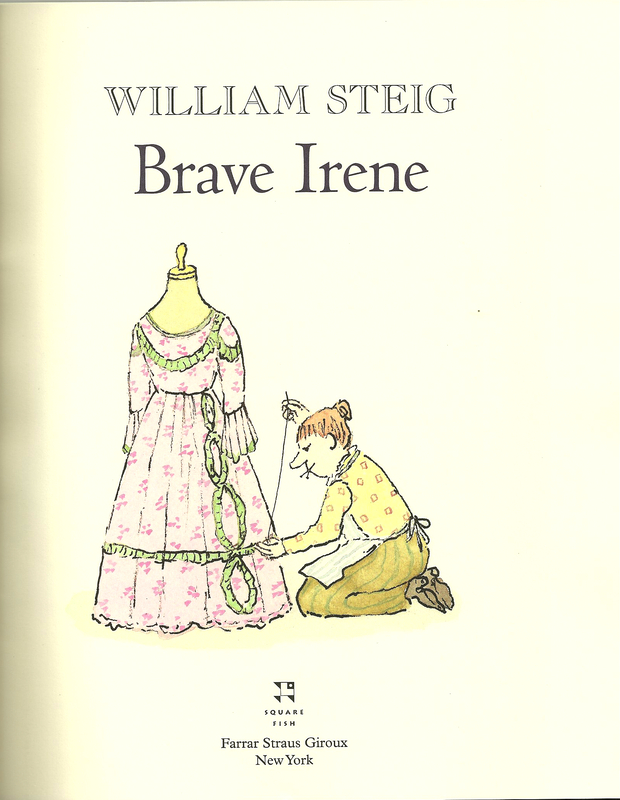 My daughter was five years old at the time, the perfect age to have this small story by William Steig read to her. Its title is Brave Irene. If you sew and you haven’t read it, you should; even if you don’t sew, you should read it. This book is still in print and available on Amazon, of course! The publisher is Farrar Straus Giroux. Quite simply, it is the story of Mrs. Bobbin (how perfect is that name? 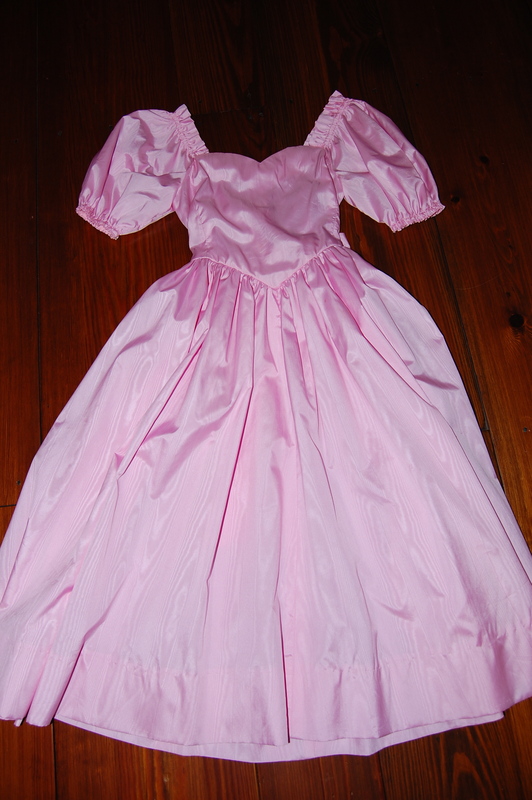 ), a dressmaker who has just finished a fancy pink and lacey gown for the Duchess to wear at the evening’s Ball. Mrs. Bobbin, the dressmaker, puts the final stitches in the ball gown. However, Mrs. Bobbin is too ill to get the dress to the palace. Her young daughter, Irene, takes charge – putting her mother to bed with blankets and tea – and then, with the dress carefully boxed and tight in her arms, setting off to deliver the beautiful dress to the Duchess. Everything that can go wrong, does. 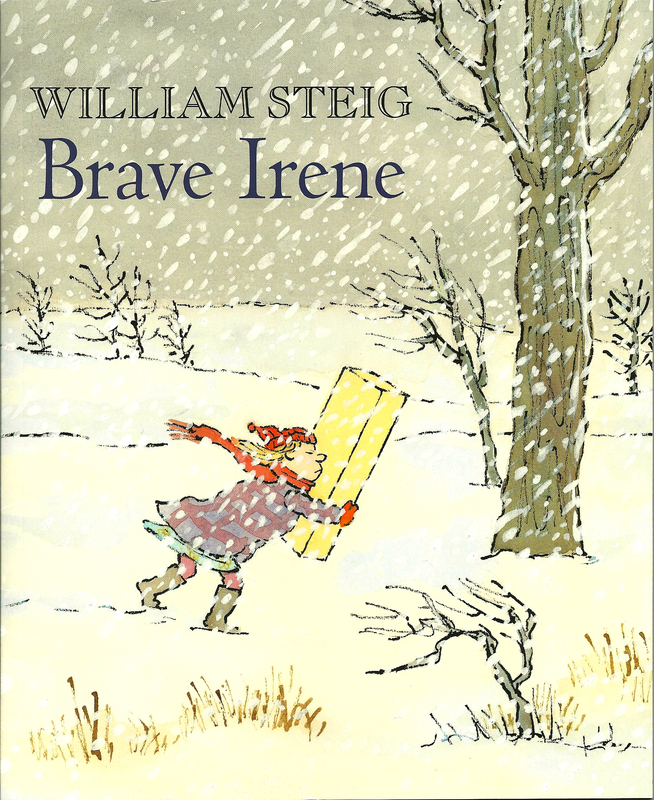 It is snowing mightily, and the wind is so strong that Irene can barely walk with her large precious parcel. Suddenly the wind grabs the box and whips the dress out of it. Away it flies. As if this humiliation were not enough, Irene steps in a hole buried beneath the snow and hurts her ankle. At this point she just wants to go home, but forward she persists, ignoring her pain and searching for the palace in the swirling snow. Finally she sees its glittering lights, and as she approaches it, she sees the most wonderful sight: the beautiful gown is spread out on a huge tree trunk, held in place by the hateful wind which had torn it from her. So – Irene and the dress arrive at the palace with much fanfare. 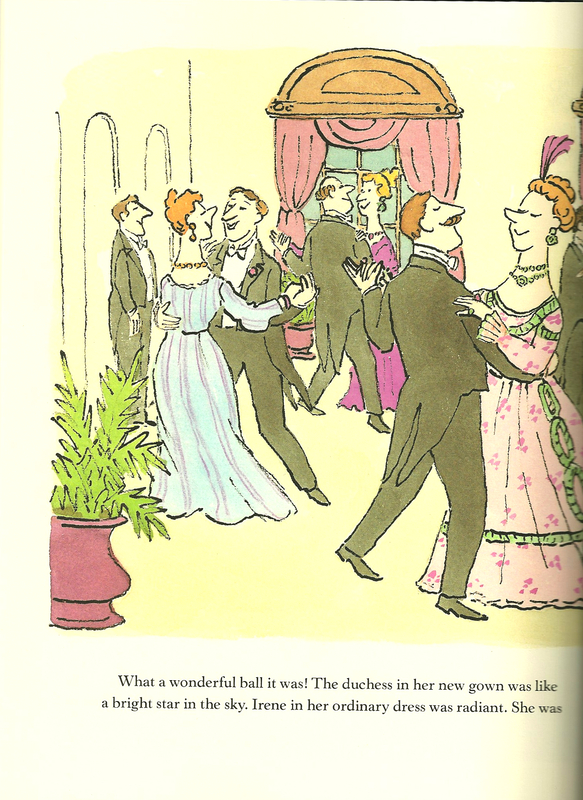 Needless to say, the ball is a wonderful success with the Duchess in her glorious new gown and Irene, in her simple dress, is just as glorious. The Duchess in her new gown . . .
. . . and Irene, brave and honorable, enjoying the Ball! 1) The art of dressmaking is in full display, with pride in accomplishment and recognition of the intricate, time-consuming, and complicated work that goes into the construction of such a gown. 2) Irene’s love for her mother and understanding of the immediacy of delivering this important dress to the Duchess instill in her a take-charge attitude. We all know those times in our lives when we must take charge – they choose us, we don’t choose them. 3) Irene was not going to give up, even when she thought all was lost! She was determined to do the honorable thing. 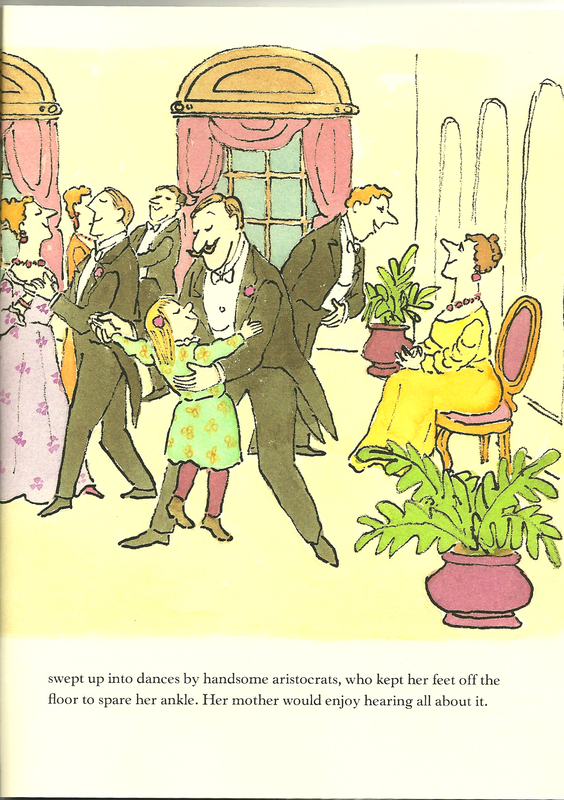 4) Irene attended the Ball (as an unexpected guest of honor) in the only clothes she had with her – her simple dress. However plain her attire, her attitude made her radiant. 5) Sometimes a piece of clothing will take on special significance because of the circumstances under which it is worn. I daresay Mrs. Bobbin’s beautiful creation was thus for the Duchess! A dress for playing out the storyline of “Brave Irene”. Here is the back of the dress, with its beautiful bow. And then a couple of years after that, I needed to make a contribution to a fund-raiser at my son’s school. 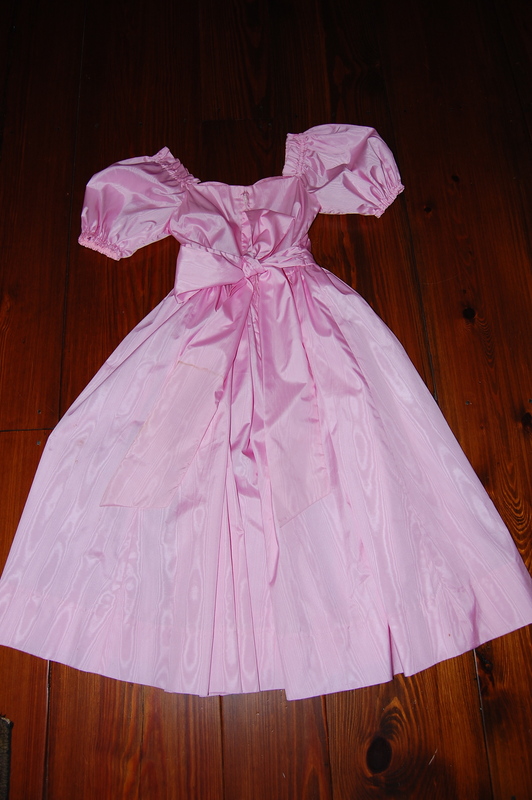 So – I put together a “Brave Irene” auction item, which consisted of another “duchess” dress, this one a little fancier, with lace flourishes and silky ribbons. I lined a sturdy, new cardboard box with shiny white paper, addressed it to the “Duchess c/o the Palace” (with Mrs. Bobbin’s return address, of course! ); placed the dress in the box, with a new copy of the book, and a wool scarf for “Irene” to wear on her journey. In retrospect, I should have included a tomato pincushion, too, and maybe a tape measure …. 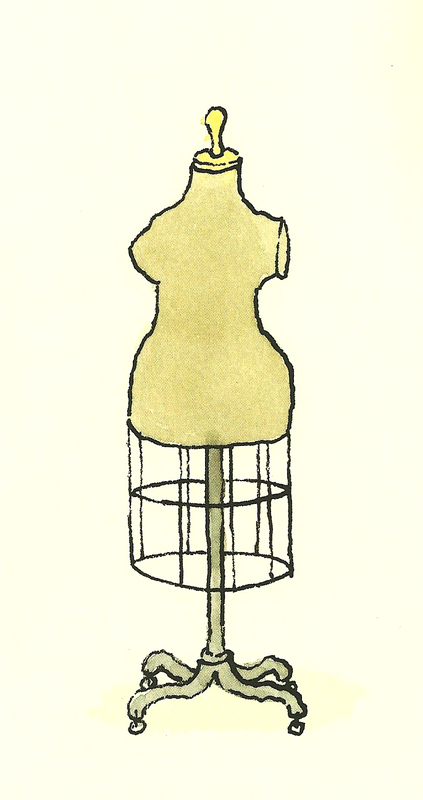 Mrs. Bobbin’s dress form (called a “dummy” in the book). Whenever I read this simple story, I wonder if William Steig might have been inspired by this quote by Isaac Bashevis Singer: “What a strange power there is in clothing.” Indeed! I can’t believe I’ve never heard of this book! I have a whole library of children’s books (thanks to my parents) but I never even read this at the library. So glad I have introduced you to this charming book – and thanks so much for listing the Amazon link. I have read this book. It is just enchanting. Dressmaking is an art form that I am so happy to see, coming back into vogue. So glad you agree with me about this dear book! Thank you for your comment and for reading my blog! Oh goodness. That dress gave me HOURS and HOURS of playtime. I remember going into your closet to borrow heels with which to wear my “dutchess” dress. Not only are you an incredible seamstress…you are a world class (and inspiringly creative) MOM. You just made my day! It’s always been fun being mom to children who appreciate the creative things in life!